If your iPhone has LTE networking, and most do these days, there are some situations where you may want to disable the LTE cellular network. This can be helpful in a variety of cases, from a self-imposed data throttle of sorts, to even gaining a more stable connection in a situation where you may notice the LTE network will drop or cycle quickly between 3G, LTE, or even 2G / EDGE. That latter situation, which usually occurs in low coverage areas, can lead to quick battery loss or continuously dropped calls, as the iPhone is constantly seeking a signal, and turning off LTE is often a quick remedy for it. While some cell providers allow you to switch the data speed directly in the iPhone Settings, which is another approach to the aforementioned issues, not all providers do so. Nonetheless, all providers with LTE do allow you to turn off LTE in one way or another. 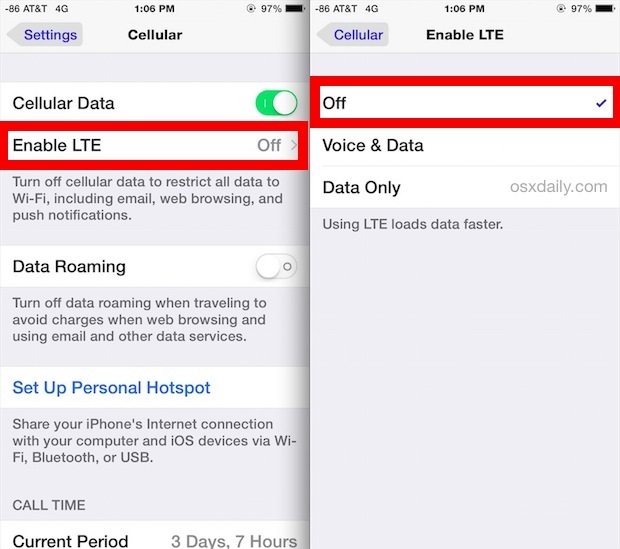 In any case, here’s how to turn off LTE on an iPhone. * Note that some carriers show “Voice & Data” here instead if they allow you to actually change and set the data speed manually at 3G, LTE, or 2G. That is not the case with all cell providers or cell plans, and when that manual control is absent, disabling LTE will instead cause the iPhone to use either a 3G or 2G connection, whichever is available. Do note that LTE is dramatically faster than 3G / 4G, and in some areas, 3G is so slow or oversubscribed that it’s practically unusable to transmit any data beyond a block of text. If you’re doing this because you’re hitting your cell plan limit and want to self impose some data throttling, another option would be to simply disable data completely and instead rely only on Wi-Fi while the iPhone is up against the cellular data plan limitation. This particular iPhone used in the example screen shots is using AT&T with an unlimited data plan, which does not offer the data speed selection directly, but instead will switch to the 3G (4G as AT&T calls it) if LTE has been specifically turned off. I’ve heard from some users that other AT&T plans do give a manual feature that is enabled through a carrier settings update, but that is not the case with this particular device. For the vast majority of iPhone users, just keep LTE on, the performance is so superior to the other networks that turning it off, even if it may save some battery life, is not worth the speed reduction. If your interest in this is to extend how long an iPhone lasts on a single charge, perhaps a better approach for most users is to use Low Power Mode but keep LTE enabled anyway. What does LTE stand for anyway? LTE stands for Long Term Evolution, and it represents the high speed wireless communications technology that many modern cell phones and cellular devices use for high speed mobile communication. LTE is not iPhone specific, it is used by many modern cell phones for high speed data transfer. You’ll often see the “LTE” symbol in the corner of an iPhone, and other cell phone and mobile devices too. When you see the LTE symbol on your device, that means you’re connected to an LTE network, as opposed to 2G EDGE, 3G, etc. There is an error in this article, 4G is not the same as 3G. 4G is the same as LTE. Yes for all cellular carriers except with AT&T, AT&T calls their 3G network 4G, and their 4G network LTE. Marketing gimmick, would be my guess, because when Verizon had a larger LTE network and was calling theirs 4G, AT&T rebranded their 3G HSPA+ network as “4G” until their LTE rollout would be further. Now they both refer to their networks as LTE. HSPA+ in theory is supposed to be pretty fast, but in practice HSPA+ is very slow on the AT&T “4G” network and I can barely transmit a few bytes, whereas the AT&T LTE network is speedy and usable. I like AT&T by the way, I think they are the best in the USA for coverage and quality for the price, but the “4G” network is no LTE, you want LTE. LTE is the best available right now. A true 5G network is in the works too, that should be good. Thank you for explaining the ATT marketing of LTE and 4G. When I am in area and loose LTE signal and switches to 4G, voice and data quality drop. Very frustrating at times. I work in the oil fields of south and west Texas and Louisiana. ATT is the only carrier that will work in some of these remote areas. Verizon is OK but stay away from Sprint and T-Mobile if in these areas. Another reason you might want to turn LTE off occasionally: AT&T has provided many customers with an M-Cell to boost phone performance. Our M-Cell will not work while the phone is using LTE (confirmed at the local AT&T store). As we need the M-Cell at home, we turn LTE off until we go out again. Can I disable 3G only and work on 4G? If you have LTE and an iPhone, you hvae this option. Tx for the explanation. 3G, 4g and let can be so confusing. I suppose “Cellular” is an American localisation (or a carrier one, which probably amounts to the same thing). It appears to called “Mobile Data” on my phone. Yes. Cellular Telephone and Cellular Data in The United States of America. I have adopted Mobile to indicate my cell phone number in my email signature, because I think it sounds better. Although everyone knows what a cell phone is around here, I’ll bet most consumers in the USA, and probably elsewhere, do not know what the CELLULAR part means, so Mobile is a little clearer. Much, much thanks for this valuable information. I have spotty service and an external antenna. After about 30 minutes of 3g, verizon kicked me over to LTE – at a huge loss of service. 5 bars to 1 or 2. So glad to get it disabled as I used to have to hide the phone under my leg to block the signal so that it would revert to 3g. But, as you know, this make-shift proceedure was a waste of time. My problem with the iPhone 7plus on Verizon is the stupid hd voice. I DO NOT like the sound of it when my gf also has the 7plus is speaking. It sounds like she is speaking on a voice activated mic in a bucket. Has static and hissing and she sounds like she has a retainer in her mouth. Verizon solution was turn my LTE to voice only. That sounded great like a normal phone call, problem was next day I found out that also turned off my data while on a phone call. I was not happy. Apple genius blamed Verizon and Verizon said go see Apple. So there is isn’t a solution as of yet that I’m aware of. Personal opinion I’m not impressed with that hd voice on Verizon while speaking to another iPhone user. If I speak to Verizon or my company on a regular phone they sound fine. Just my opinion folks. Makes me regret switching from Android to IPhone. I assume you mean Verizon told you to set LTE to ‘Data Only’. This means you turned off voice over LTE (VoLTE) which means that your phone calls go over the older 3G network and your phone has to move its radio to the 3G mode, turning off your data. Some providers allow data & voice at the same time on 3G, some do not. Does your girlfriend also use Verizon with her iPhone? The HD Voice between providers could be messing something up. If she is using Verizon maybe it’s worth having her call another iPhone user to see if the problem is with her phone. Also, when talking to people who aren’t on HD Voice-capable devices (like your company & Verizon) the call still goes over LTE but is converted for regular telephone lines. I just turned this off on the My Verizon website. If forget which tab it was on the left (down near the bottom). services or something like that, and you can turn off the HD voice. Can anyone help me with this question I have? I have an iPhone 5s, and I will always get a new phone card each month because I can’t get unlimited data. After five days of using LTE, it converts to 2g at a lot slower speed. Can anyone give me ideas on why or how to fix it? After upgrading iphone to OSXI my calls keep weirdly dropping. Apple suggests turning off LTE. We will see? I really don’t think that’s the problem and I don’t like that the option isn’t available. I’m on AT&T and it stays on 4G and does not use Lte? Which one is better to use? I have an IPhone 7-Plus? You must have LTE enabled to use LTE, enable LTE if you turned it off. LTE is faster than 3g/4g and thus most people want to use LTE on whatever network they can. Have 3 tvs in our house. Just bought a Verizon 4g lte network extender. Now two of the tvs have perfect screens while the third tv is now snowy with static. Only change has been to plug in that new extender. Any idea what’s causing the static on the third tv?